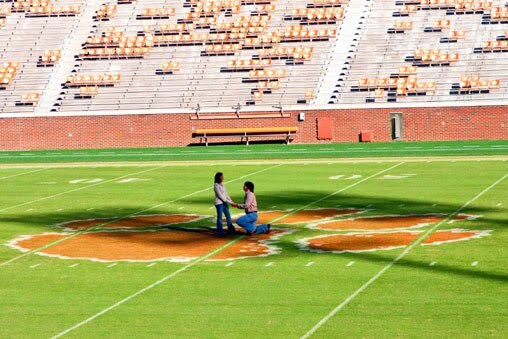 A Clemson Girl blog reader emailed us last week and wanted to share her Clemson love story with us, including her engagement photos and the story from both her and her future husband's point of view -- which we loved! 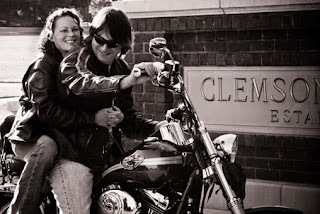 "It must be said that Clemson runs deep in my blood. 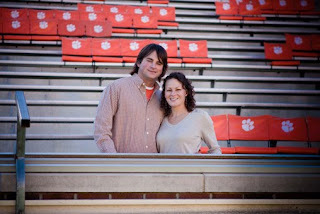 My parents met at Clemson and married at Clemson United Methodist in '83... and both sides of my family has many Clemson graduates and fans and current students. Orange is our color. That being said, I have of course always dreamed of attending school here. For undergrad I was offered a scholarship to play soccer at Winthrop University, so of course I took that awesome opportunity and enjoyed every minute of my 4 years there. But then there was the idea of grad school... and now I am here at Clemson pursuing my PhD in Chemistry! 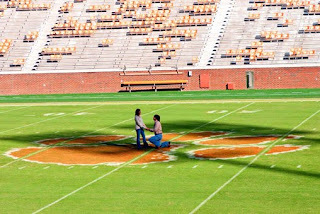 I am getting married October 15th... and yes, my fiancee Casey and I waited until the ACC football schedule came out to assure we weren't going to have our ceremony during a home game. When I created our wedding website I really wanted to have the two side of how we met, and so I asked Casey to write his version, and I wrote mine separate... here they are:"
To set the scene, I am an avid Clemson football fan and nobody gets in my way when it comes to trading in tickets for the front row. For the 2008 Clemson vs South Carolina game I was DEFINITELY sitting on the front row, especially since I had tickets for my mom and dad for her birthday. So we camp out the Monday before the big game, wait in line until 7am, etc... and as the crowd is led down to the ticket window we see an undergrad already walking away. This means he didn't wait all night, broke in line, and got a front row ticket. Oh buddy, I was a little ticked. But come to find out he only got one so there were plenty left for us. Phew. On November 29, 2008, a rainy & cold day to have a football game, my parents and I sat in the front row, and to my left there was a guy all by himself. I've never been very good at NOT talking to people, especially if I think they need someone to talk to or I've had some beers (or both). I'm decked out in my beanie and snow jacket, and not at ALL thinking I'm going to meet anyone. As the game goes on it goes from cheering together, to high-five-ing together, to actually talking to each other. Then at half time we sit and introduce ourselves and talk the entire time. I find out he graduated from Clemson the year before with an English degree and that he lives near Greenville and has friends in the area, so that's why he's at the game. I just keep thinking, what a nice, super cute guy! So the game continues, I bounce around to Zombie to both keep warm and cheer on my Tigers, and he laughs at me. Clemson won (WooooHoooo!) and Casey asks what I am doing after the game. I say that my parents are here and we'll probably go find my cousins tailgate and hangout there. 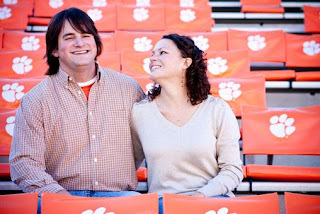 So I tell him if he's ever in the Clemson area again to give me a call and we could hang out (I wasn't looking to date anyone at the time, just friends). And he says sure, maybe we could do lunch some time. Okay, cool. So we exchange numbers, he says good bye to my parents and me, blah blah blah, and we go our separate ways. 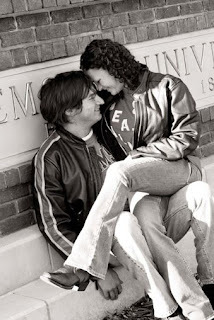 Two days later he calls and we schedule our first dinner date... and I knew from right then that this would be great. It all started with a ticket. 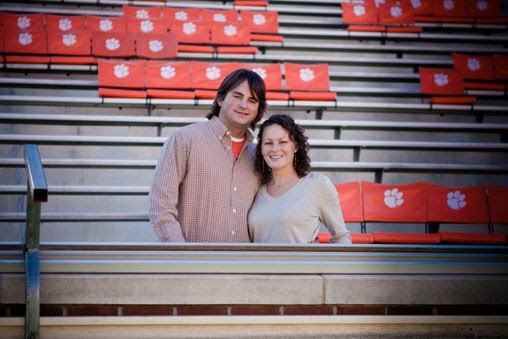 I had graduated from Clemson in the summer of 2008, and although it was nice to have the “school” part of school behind me for the time being, I sorely missed the free football tickets I had received during my four years attending. Thankfully Laura Jane, being the awesome sister but not-so-big-of-a-football fan that she was, willingly gave me her ticket to the big game at the end of the season. Thanks Sis, that got me into the game, but the plot continued to thicken. As hard as one ticket to the Clemson vs. USC game was to come by, in a strange turn of events my old roommate James also came up with two tickets that I could have. This “strange turn of events” might be described differently by Carolyn, but lets not get ahead of ourselves. Anyway, whereas Laura Jane had given me her ticket she’d picked up, the two tickets that James offered me were general student tickets that he had miraculously traded in for a first row seat and another a little farther up. He told me he had simply walked up to the ticket counter and traded them in before going to his eight o’clock class, but that he and his girlfriend did not need them, because they already had seats. Having never sat in the front row before, I jumped at the chance to not only sit in a seat (I had always sat on “The Hill”), and so close to the action. With the chill dampness of late November in the air, I quickly made my way through the stadium gate, ticket stub and lapsed ID in hand, and down the steps to section B, row A, seat 29. Although I wasn’t really worried about sitting by myself during the game, apparently someone beside me was. It wasn’t long after the game had begun that I noticed a very bouncy girl beside me cheering for all she was worth. I don’t think her feet stayed on the ground for more than a few seconds at a time. With such an energetic gal next to me, it was only a matter of time before we were conversing in between cheers. With friendly eyes peeking from inside a hood drawn tightly around her face, Carolyn asked why I was sitting by myself. Although I’m pretty sure the conversation didn’t occur that day, as it turns out, James’ ticket trade earlier in the week had unknowingly enraged a small band of graduate students who had been camping out since before dawn to get front row tickets. James had unknowingly broken in front of them in line and had gotten one of those prized tickets and had given it to me. One of those graduate students was Carolyn and I have no doubt she was close to strangling James before she even knew I existed. What a different relationship we would have had then! 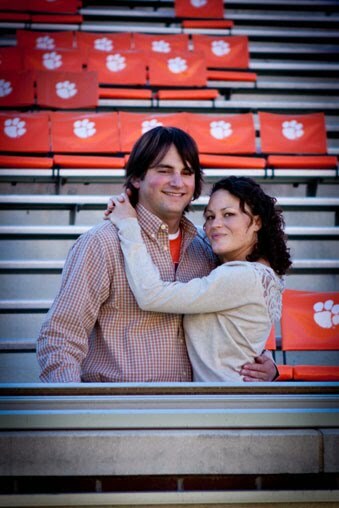 I can’t really recall what all we talked about during the game besides well, football, but I will always remember those sparkling eyes under that Clemson beanie, the Tiger dumping rainwater on us from the floodlight above, and the infectious laughter coming from that bouncing girl in the big ski jacket. -And oh yeah- I got her number. That is how we met. 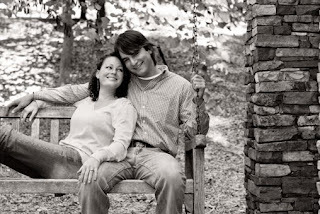 Carolyn says their story makes her smile every time -- it made us smile too! Thanks so much to Carolyn and Casey for sharing their amazing Clemson love story and engagement photos. 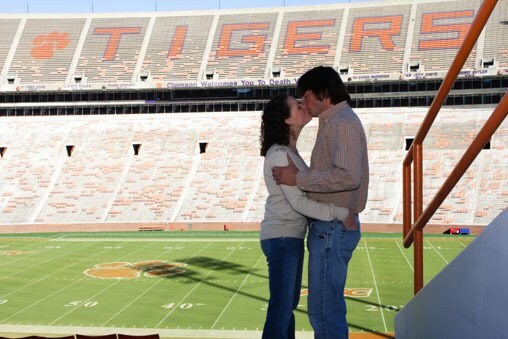 It just goes to show you that ANYTHING may happen at a Clemson game -- like meeting your soul mate. Such a cool story. Do you have a Clemson love story, Clemson wedding, Clemson engagement photos or anything else Clemson wedding-themed you would like to share with the readers of this blog? Email us at clemsongirlblog@gmail.com! 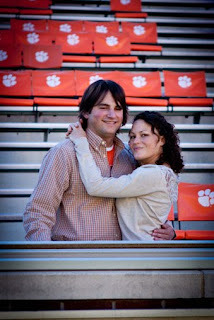 My fiancee and I also met in the student section at a Clemson football game. It was the 2002 Clemson-Carolina game. The craziest thing is that we grew up in the same hometown and never met until that day in November.